The mechanical components of the fan drive system have typically been the largest maintenance issue for cooling towers. Misalignment, gearbox leaks and excess vibration are some of the main issues we encounter. 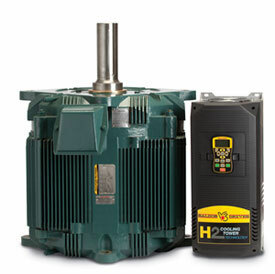 This new drive package eliminates the gearbox and couplings from the cooling tower system providing improved efficiencies. The fan blades mount right on the Baldor motor. The permanent magnet control also increases operating efficiencies in lightly loaded conditions. The motor is designed to fit your existing Amarillo and Marley envelope to provide for easier retrofit. This drive package is a great way to save energy and to simplify maintenance demands on your existing cooling tower.